Also serving communities of Jefferson City, Newport, Morristown. The average cost of memory care in Sevierville is $4,609 per month. This is lower than the national median of $4,650. Cheaper nearby regions include Knoxville with an average starting cost of $3,682. Caring.com has helped thousands of families find high-quality senior care. To speak with one of our Family Advisors about memory care options and costs in Sevierville, call (855) 863-8283. Nestled in the foothills of the Great Smoky Mountains, Sevierville is a fast-growing town that has become a popular retirement destination, with people over 65 making up nearly 19 percent of its population. The city has two memory care facilities serving its residents with Alzheimer's disease and other forms of dementia. Less than a 30-minute drive down Interstate 40, Knoxville offers 16 additional choices. As in the rest of Tennessee, memory care facilities in Sevierville are housed either in assisted care living facilities, which have no minimum residency requirement for licensure, or in residential homes for the aged, which must house at least four non-related persons. Summers are warm in Sevierville, but the city's mountainous location buffers it from the brutal heat and humidity that plague much of Tennessee. The daytime highs typically stay below 90. In an average winter, the city gets about six inches of snow, and nighttime lows average in the upper 20s. For memory care residents who enjoy getting outside for supervised recreation, Sevierville offers more than 200 sunny days. Sevierville's air quality is better than average, ranking at 65 on a scale of one to 100, compared to the U.S. average of 58. The city's relatively clean air makes it an attractive destination for memory care patients who also have asthma or other respiratory illnesses. Despite its impressive growth in the 21st century, Sevierville has maintained a low cost of living. Housing, transportation and groceries all cost substantially less in Sevierville than in the average U.S. city. That said, memory care residents with high medical bills or gaps in coverage should be aware that healthcare costs in Sevierville are about 30 percent higher than the national average. Sevierville has higher-than-average crime rates, but memory care residents have little reason to worry about safety. Most memory care facilities are very secure places, with guards, security cameras and other safety features to protect residents. Memory Care costs in Sevierville start around $4,609 per month on average, while the nationwide average cost of memory care is $4,799 per month. It’s important to note that memory care rates in Sevierville and the surrounding suburbs can vary widely based on factors such as location, the level of care needed, apartment size and the types of amenities offered at each community. Sevierville and the surrounding area are home to numerous government agencies and non-profit organizations offering help for seniors searching for or currently residing in an assisted living community. These organizations can also provide assistance in a number of other eldercare services such as geriatric care management, elder law advice, estate planning, finding home care and health and wellness programs. To see a list of free memory care resources in Sevierville, please visit our Assisted Living in Tennessee page. 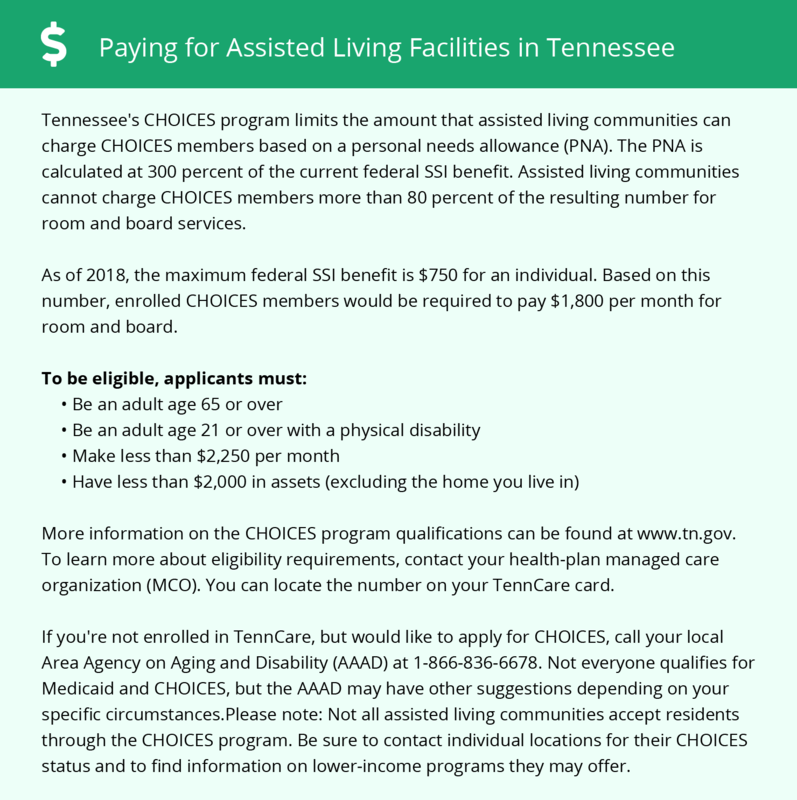 Sevierville-area assisted living communities must adhere to the comprehensive set of state laws and regulations that all assisted living communities in Tennessee are required to follow. Visit our Memory Care in Tennessee page for more information about these laws.